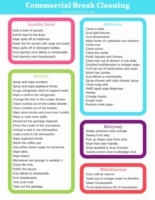 101 Commercial Break Cleaning Chores: Printable checklist! Get a tidy home in less time with these commercial break cleaning chores. Life is hectic. Between getting the kids up and ready for school, work, errands, cooking, and volunteer or community activities, it can be exhausting, too. Some days you just want to come home and unwind by watching television, but as soon as you begin to relax, there comes the guilt. This house isn’t going to clean itself, you think. “I should be doing chores, not watching TV. I have some good news: with this list of things to clean during commercial breaks you can do both, and you’ll be surprised at how much you get accomplished without giving up your favorite shows. Since 2009, the combined length of commercial breaks during a 1-hour show on broadcast television has increased to over fourteen minutes. On cable channels, it’s slightly longer: a full 15 minutes each hour. 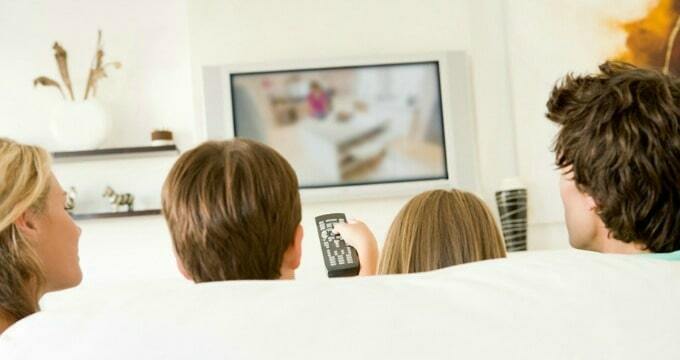 With the average American watching five hours of television each day, that could translate into an hour of cleaning during commercial breaks, with time leftover for potty and snack runs, too! Use the organized printable checklist at the bottom of this entry to turn TV time into productive time. Even the kids can help! Switch laundry loads from washer to dryer. Wipe detergent spills off of the washing machine. Wash the dryer’s lint screen with soap and water. Wipe spills off of detergent and softener bottles. Dust laundry room blinds or windowsills. Spray and wipe kitchen counters. Spray and wipe appliance fronts. Purge a shelf in the refrigerator of expired foods. Wipe a shelf in the refrigerator. Change the liner in the refrigerator crisper drawer. Clean crumbs out of the cutlery drawer. Clean crumbs out of toaster or toaster oven. Wipe stove knobs and oven door handle. Wipe spills in the bottom of the oven (or soak until next commercial). Deodorize the garbage disposal with ice or lemon slices. Clean the inside of the microwave. Unload a rack in the dishwasher. Load a rack in the dishwasher. Spray and wipe kitchen cupboard fronts. Get coffee maker ready for tomorrow. Microwave wet sponge to sanitize it. Dust kitchen blinds or windowsills. Take out the kitchen garbage. Scoop the cat’s litter box. Wipe fronts of bathroom cupboards and drawers. Clean hair out of shower or tub drain. Soak toothbrushes in 50-50 vinegar water to disinfect. Pull hair out of hairbrushes and wash.
Dust bathroom blinds or windowsills. Spray shower with daily shower spray. Put a clean bottom sheet on a bed. Put a clean top sheet on a bed. Take dishes in the bedroom to the kitchen. Dust bedroom blinds or windowsills. Dust horizontal surfaces in the bedroom. Vacuum around the base of bedroom walls. Vacuum high-traffic area in the bedroom. Straighten shoes in the bedroom closet. Put clothes on the closet floor into the hamper. Take empty hangers from closet to laundry room. Clean out a purse or handbag. Run a lint roller over the sofa to remove pet hair and crumbs. Purge old magazines from the coffee table. Organize top of coffee table. Take dishes from TV room to kitchen. Dust walls of TV room. Wipe TV remote with disinfectant. Dust TV room blinds or windowsills. Dust horizontal surfaces in the TV room. Dust lamps in the TV room. Wipe light switches with disinfecting cloth. Dust baseboards in the TV room. Vacuum around the base of TV room walls. Vacuum high-traffic areas in the TV room. Pinch dead leaves off of houseplants. Soak toys in the sink of water with 1 cup vinegar. Pick up shoes near the front door. Wipe doorbell or door knocker. Sweep screen door to dislodge dust. Get trash out of your car. Wipe car dashboard and steering wheel. Wipe car’s inside door handles and armrests. Commercial break cleaning has another bonus beyond fitting housework into otherwise idle time: it gets you off the sofa regularly, too. If you’re like me, that means less snacking and more moving, and that’s always a good thing. So go ahead and enjoy your favorite shows without guilt. 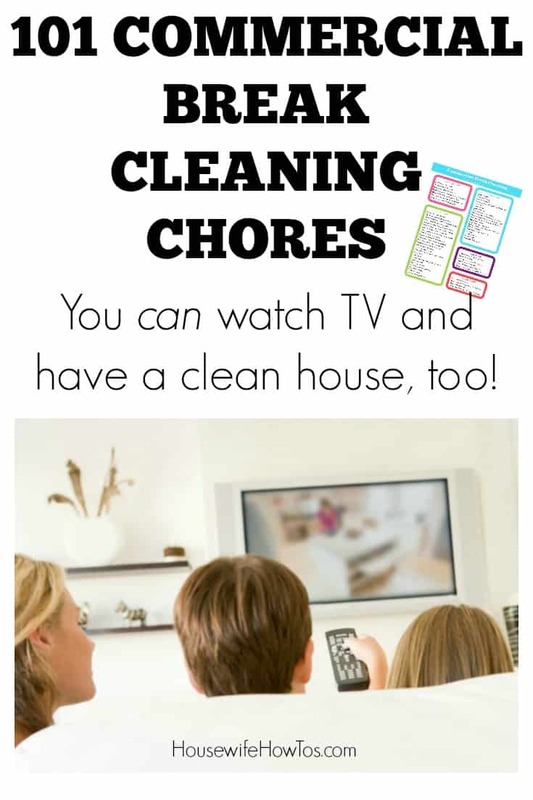 With commercial break cleaning, you can watch TV and have a clean home, too! Ready for a printable? This checklist is two pages, so you might want to print separate sheets then slide them into a plastic page protector. That way you can use a dry erase marker to check off commercial cleaning break chores and see at a glance just how much progress you’ve made! Click to open .pdf for printing or right-click to save it to your computer.